Phil Parkes is the next guest in a long line of legends for our events. Following the success of Frank McAvennie, Stuart Slater, Alvin Martin, Steve Lomas and now John Moncur in previous events we are delighted to announce that former England goalkeeper, FA Cup Winner, Boys of 86 member and a former world record transfer fee for a goalkeeper holder Phil Parkes as our next guest. Phil has recently undergone heart surgery and we wish him all the best in his recovery but he has assured us he will be fit and raring to go. 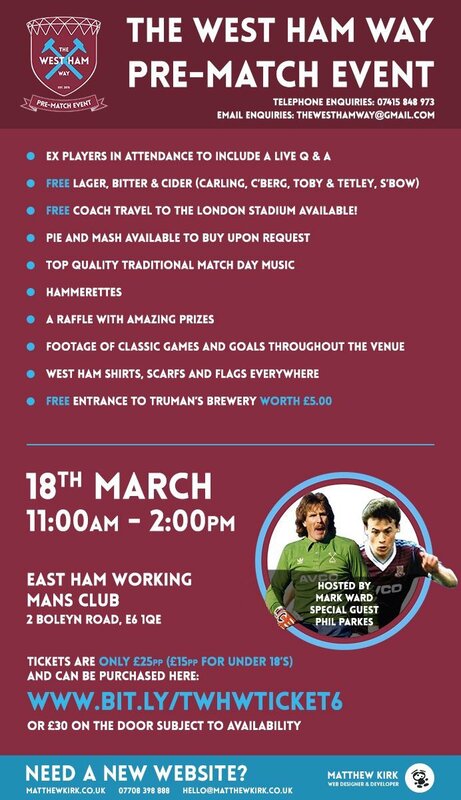 The event will take place on the 18th March at the East Ham working man’s club from 11am-2pm. Phil was voted as our Best Ever Goalkeeper and has played with many legends throughout the years. Parkes has many opinions on the new stadium and the move there and he is very interesting to listen to. We have secured a number of top prizes for the raffle too, including another signed first team shirt, which would be worth attending for alone. Our beautiful Hammerettes Bekka and Daisy will be selling these raffle tickets during the event, as well as discounted (loyalty) tickets for our next events. As our reputation grows we have more and more people wanting to attend including TV celebrities, Sportsmen and Reality Stars. We have free lager (Carling and Carlsberg), free bitter (Tetley and Toby) and free cider (Strongbow) with other alcoholic drinks available to buy at great prices. Soft drinks are also free. Coaches to the London Stadium are also included and drop you much closer to the ground than you can get when travelling by train.